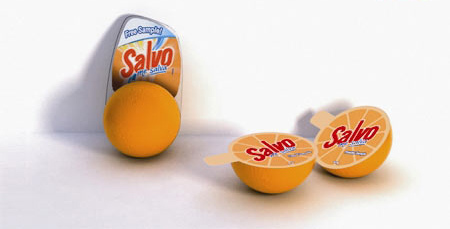 Citrus is a packaging concept for free samples of Salvo dish detergent. The idea consists on two emispheres in plastic material (HDPE or other) orange-skin texturized; pasted on a 1mm thick plastic sheet. The two sides are joined with removable glue, so you can separate them without damaging the packaging. Once they're separated you can open them by pulling the small flap on the side. Since the product is sold in liquid or powder form, the two parts are filled respectively with 50 ml of liquid product and 50 mg of powder, so you can try at your home both forms!